Following our Throw Back Thursday feature on the Norfolk Bluebird Fleetline, Syd Eade has been in touch reminiscing about a journey he had on it from Britannia Pier to Norwich, and the heating didn't work either. He says the drivers always seemed surprised to find a passenger on-board as well! Syd asks if I realised the Daimler would have been on their Norwich - Great Yarmouth stage service? I didn't! 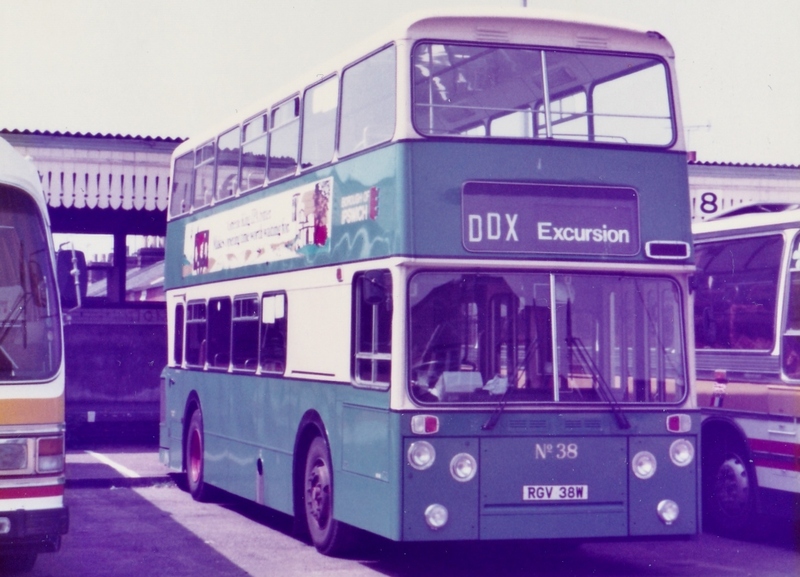 Apparently it ran opposite a MAN coach, which gave out tea and coffee on the way! 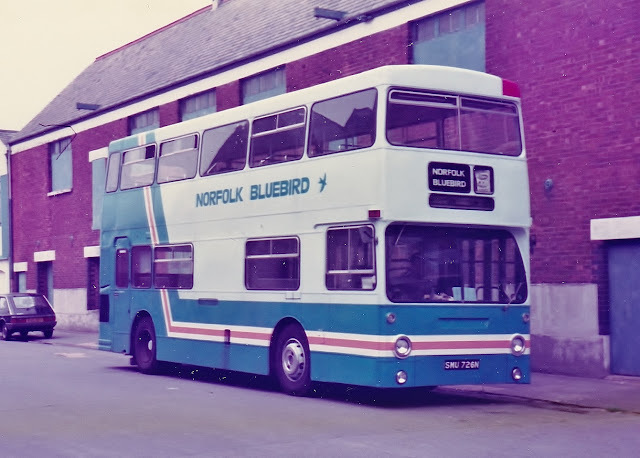 He says that Norfolk Bluebird were a great company in the short time they were about, never using destination blinds, just hand written paper stuck in the windows or nothing at all!!! 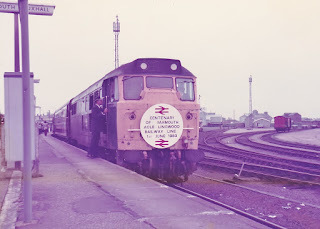 He has sent a couple of more pics he took of their vehicles including the MAN on the Yarmouth run from Norwich and the others on the 552 Mile Cross to Heartsease City Service. 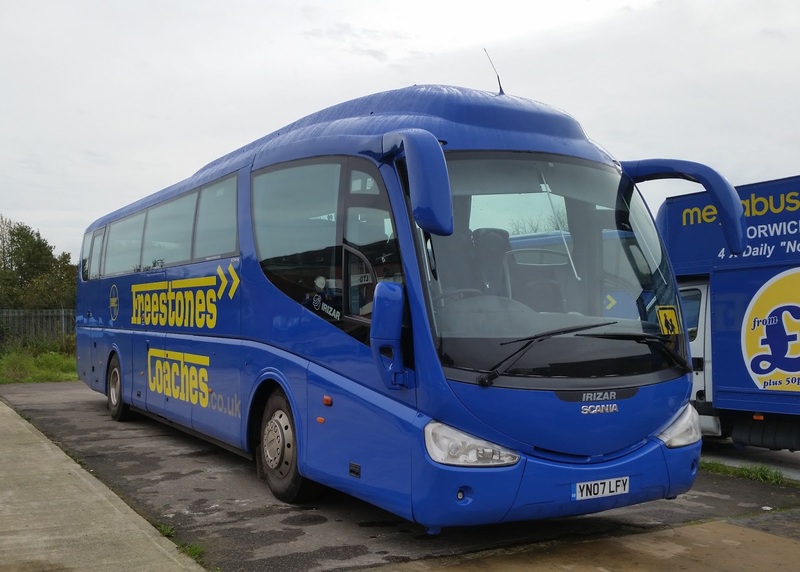 The first of a batch of Low floor Darts for Lowestoft arrived late last night from First Kernow, 42943 WA56OAS is currently at Yarmouth for inspection prior to moving down to its new home on the Suffolk Coast. The batch of Caetano bodied Darts at Lowestoft are being transferred down to Cornwall to join others of the type recently added to the fleet from the Potteries. 42358 & 43865 were moved to Roundtree Way in Norwich yesterday evening prior to their journey down to the South West. Gemini 37275 from First Berkshire is also being collected today from Slough and will go straight to Full Circle at Banham for repaint into Excel livery. Two Geminis from Yarmouth are due to transfer to Lowestoft due to changes to the X2/X22 services, possibly 37573/37574 but yet to be confirmed. Alexander bodied 30900 is having a new engine fitted at Volvo and once complete it will become a Yarmouth vehicle after a lengthy period on loan here. 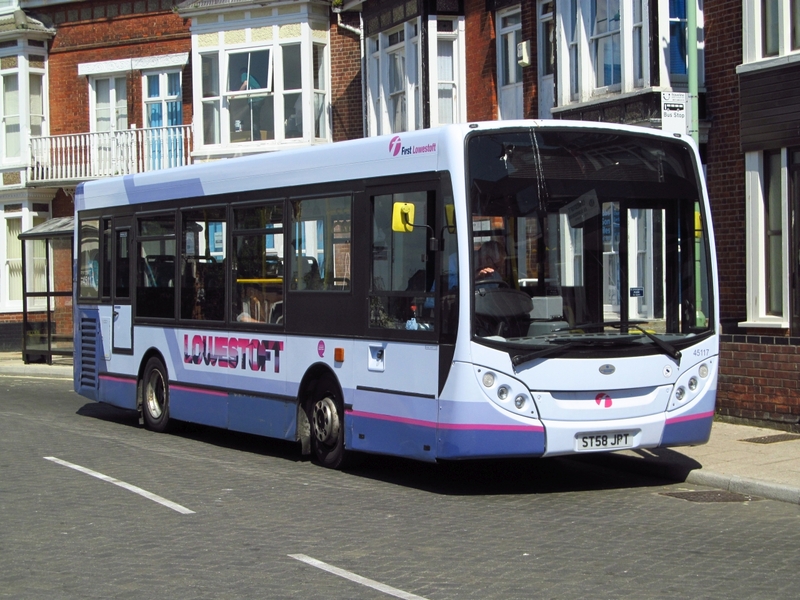 A few moves and happenings to report, starting with Roy's news that Enviro 200 Darts 45116 & 45117 have returned to Lowestoft from Norwich. 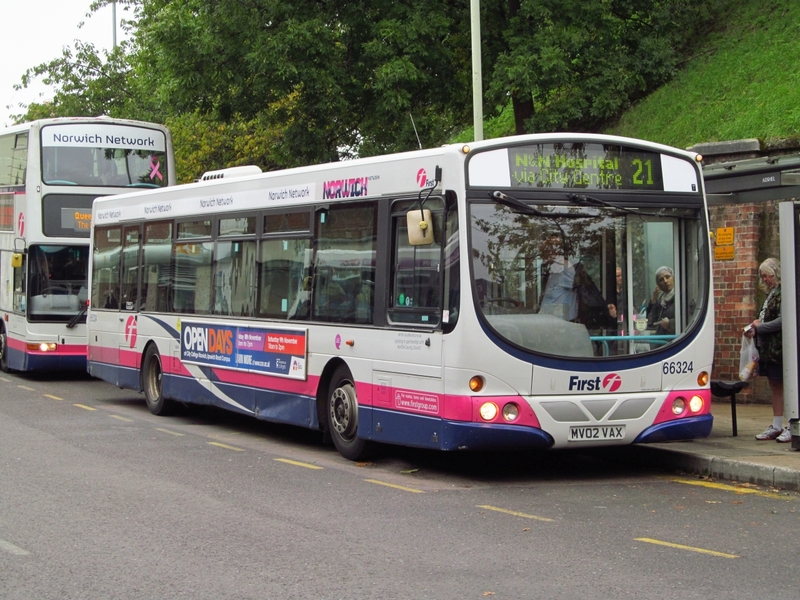 45117 was noted this evening working the 106 service in the town still wearing Norwich fleetnames. 45117 ST58JPT at Gordon Road back in May 2014. 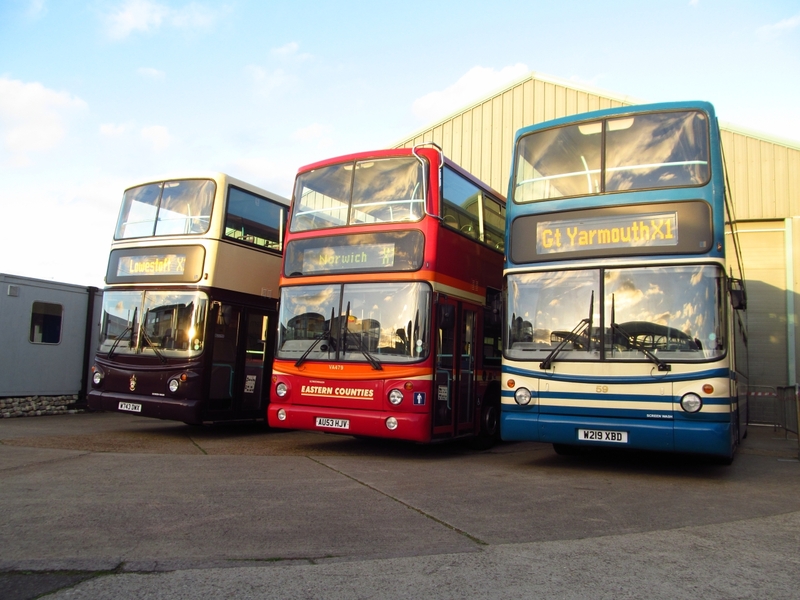 33160 LR02LXV has gone up to Rotherham for refurbishment whilst Volvo B7L's 66325 MV02VAY & 66346 MV02VCZ have made the trip down to Bristol. 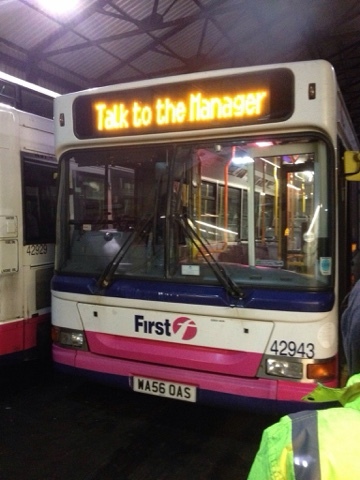 The last remaining Streetlite Max for Norwich to be delivered is 63321 SK65PXB which is currently at Belfast awaiting the ferry trip to Heysham. The latest to enter service in the city is 63327 SK65PXH in standard urban livery. 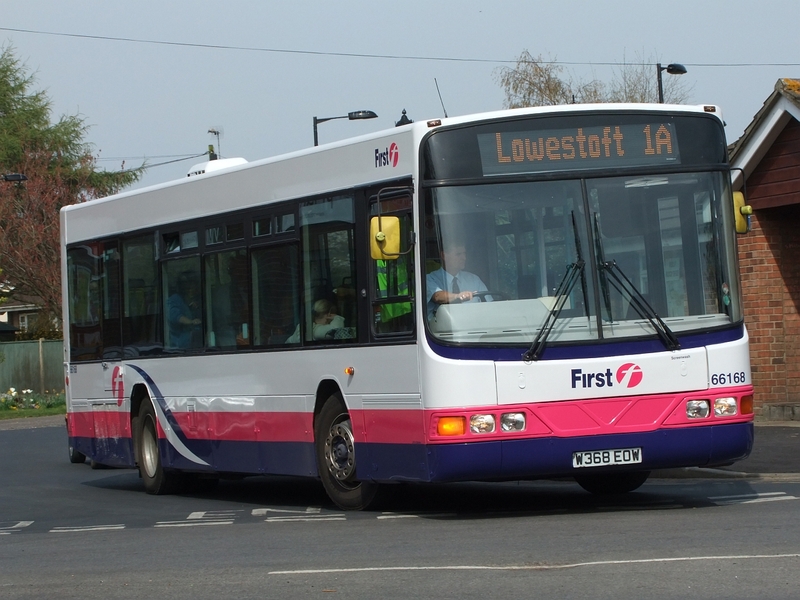 First are supplying vehicles for ongoing Rail Replacement work alongside Abelio Greater Anglia at both Yarmouth & Lowestoft, 33423 was at Lowestoft on Monday morning with 37579 noted at Lowestoft station today with Yarmouth Streetlite 47506 noted at Vauxhall Station this evening. GYT Heritage liveried 32059 was noted working the 1 service between Yarmouth & Martham on Sunday. Sister 32064 was noted working the X1 on Monday morning. As reported by Grahame last week, former First Essex 66168 W368EOW has returned to Great Yarmouth to help out with the increase in the Bernard Matthews bus requirements. 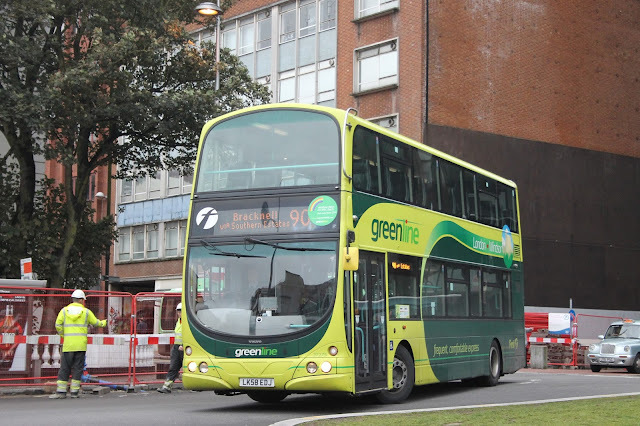 A reliable source at First informs me that a second Green Line Volvo B9 double decker is due to arrive at Great Yarmouth's Caister Road depot very soon for use on X1 services. First Berkshire 37275 LK58EDJ is to join sister 37274 already on the route and it will also be painted in a modified Excel blue livery. This could no doubt cause some confusion as its registration is very similar to that of Gemini 37578 AU58EDJ which is also in Excel blue! On the subject of Geminis, two further examples are to eventually go to Lowestoft plus 37566 AU58ECE is due back from repairs within the next week or so. These moves reflect the increase in the number of buses required for the new X2/X22 timetable due to commence from 6th December. 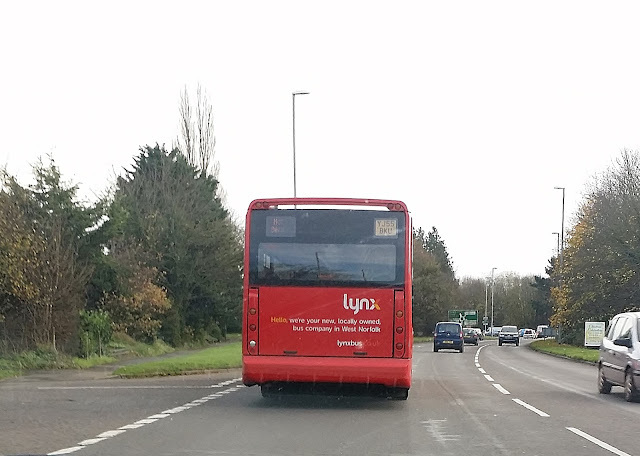 Suitably armed with a camera, just in case the Olympian appeared, I headed northwards and sighted the first decker with 'contract' as its destination in the form of ALX400 32061 W221XBD followed shortly after by sister 32062 W422SRP. Then a number of questions formed in my mind ... would there be a third decker? would it be the Olympian? would it be 32063 to continue the sequence? (on the X1 apparently!) I was soon put out of my misery by what I thought in the distance was the Olympian with its comparatively larger destination screen. Latest news from First sees the return from Rotherham of 33159 LR02LXU in the new Orange line livery with 33162 LR02LXX heading North for its turn to be refurbished. Two more Volvo B7L's have left Norwich bound for Bristol, 66324 MV02VAX & 66330 MV02VBE are now in the South West. Both former First Essex Volvo B10BLE's 66168/66169 are now based at Yarmouth due to increased Bernard Matthews Contract work about to begin. 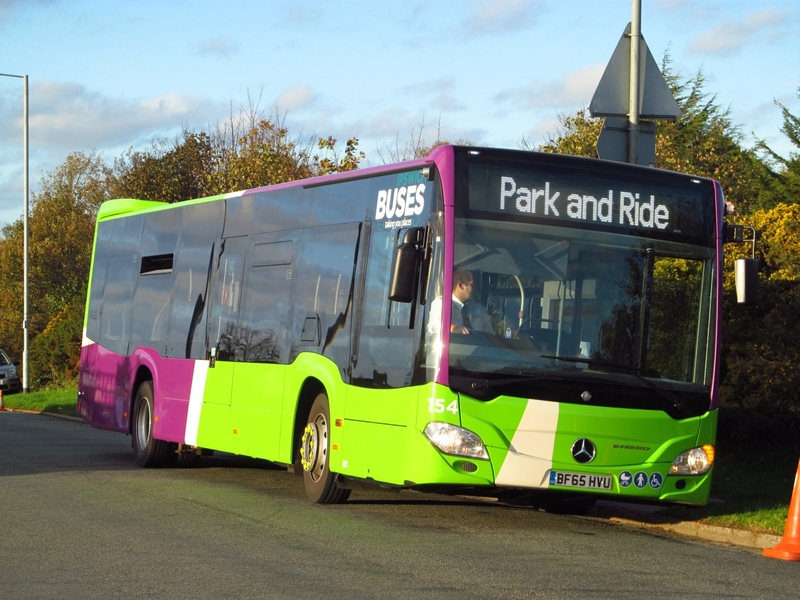 Coach 20501 AO02RBY has been busy on various Rail replacements in Norwich and today in Yarmouth. The Rail work is set to continue into next week with Trains not working from Yarmouth until after the weekend at least. Due to the Train problems extra X1 duties are being put in place between Yarmouth and Norwich to assist with the replacement Coaches, so expect a few odd sightings with X1 on the screen! The weekend should also see Enviro 200's 45116/7/8 move back to Lowestoft from Norwich and the possible start of the Jersey Darts beginning their migration to Devon & Cornwall. 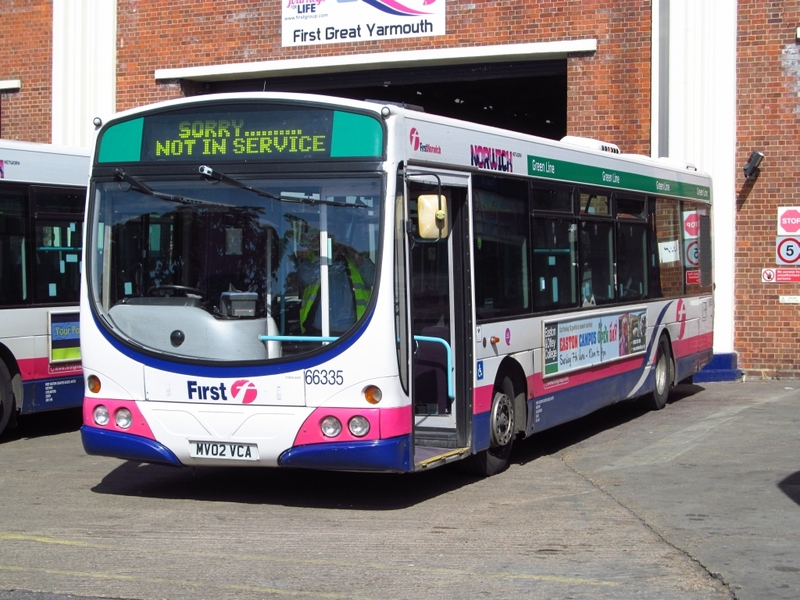 Norwich Pink Line branded 33246 was noted working the 8 service at Yarmouth yesterday, she is here for MOT work and was available yesterday prior to her work starting. Thanks to Danny & Chris for the info. When with Swift, the DAF was given the name "Swift Owl" and received fleet number 106. 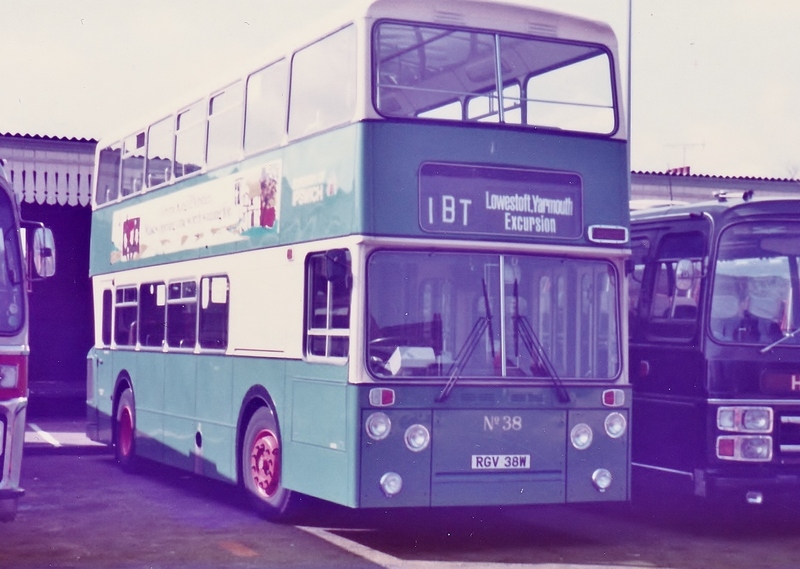 The 43 seater was thought to have been originally registered T20JLS when delivered new to Leask of Lerwick in June 1999. 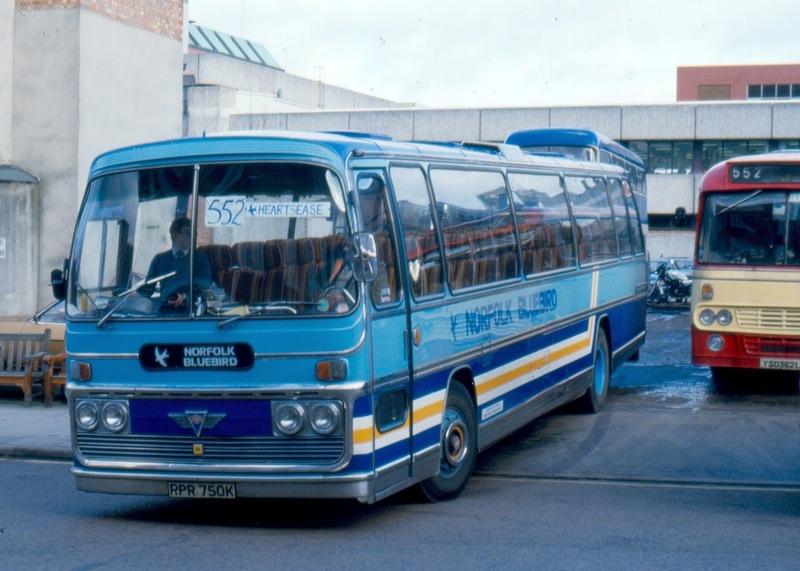 It formed part of Swift's fleet up until around August 2007, when it left for Cooper's Tourmaster in Bedlington. Their disposal means that Swift now have only two full size coaches in the fleet - Dennis Javelin SJI8127 and Mercedes Benz MW51WFT and both were at Swift's Southtown yard this morning. Yesterday saw two former Eastern Counties vehicles return after moving to First Essex. 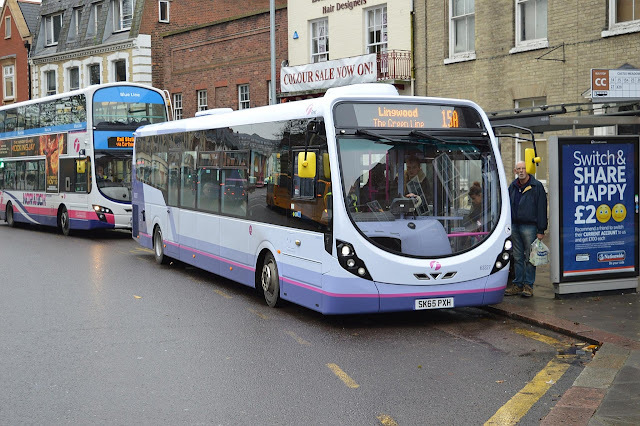 Volvo B10BLE's 66168 W368EOW & 66169 W369EOW will be used at Lowestoft and Yarmouth due to the vehicle requirement increase for Bernard Matthews contract work during the Christmas period. More double deck vehicles will be used on the contract so the new arrivals will plug the gaps on normal routes within the area. 66168 at Hemsby Kingsway back in 2010, shortly after repaint, she has since gained the new livery in Essex. The two originally arrived with FEC back in 2009 along with sisters 66165/66177 & 66179 from First Hants & Dorset, they began life in Norfolk at Norwich before moving down to Yarmouth in early 2010, they then moved on to Essex IN 2011. They will now remain with FEC until DDA changes force their withdrawl. 66169 is currently at Lowestoft with 66168 arriving at Yarmouth today from Norwich. Thanks to First and Chris Speed for the info. Grahame. Yesterday saw the 50th Anniversary celebrations for the Ipswich Transport Museum with a special event to mark the landmark for the popular venue in the suffolk town. I was lucky enough to be able to attend with Great Yarmouth Swift WEX685M and Chris Speed. 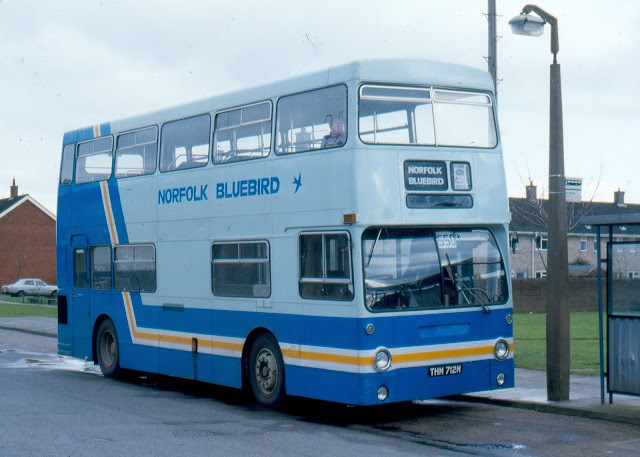 Also making the trip from Yarmouth was Great Yarmouth Transport liveried ALX400 32059 driven by Mr Speed Senior (Des!). 32059 provided a few trips for the Park & Ride service operating for the day. We left Caister Road around 8.45am and had a good trip up down to Ipswich arriving just before 11.00, 85 & 59 were parked together at the front of the museum for the first part of the day and provided many enthusiasts with good photo opportunities. 85 was used on a few trips around the town along with various other visiting vehicles from around the local area. The event also saw the first time that all three First Eastern Counties Heritage liveried ALX400's had been together, Lowestoft's 30888 and Ipswich 32479 were also in attendance at the event alongside 32059 from Yarmouth and a photo shoot was hastily organised in the late afternoon in the Museum's yard with all three side by side at last. All three ALX 400 lined up in the fading winter afternoon sun. This was my first visit to the museum and it was well worth it, lots of exhibits inside the building covering all sorts of Transport not just Buses from Bicycles to Lorries and even a Hearse!. The latest addition was also on show, that being former Eastern Counties Scania L94UB 65589 V589DVF which was lattererly with First Essex at Colchester and was withdrawn only last week before being donated to the Museum. A very enjoyable day and credit to all at the Museum for a well organised event and some very nice bacon rolls!. Thanks also to Chris for the invite and to Des for the trip home. 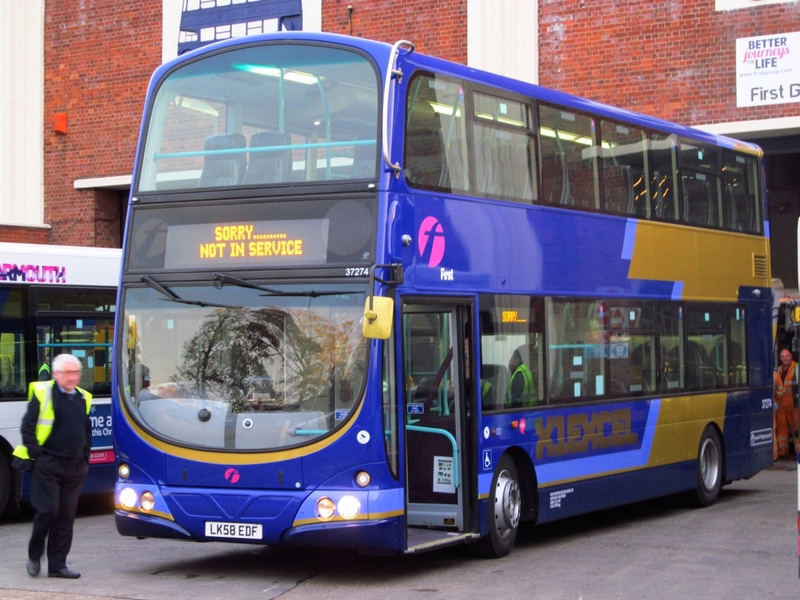 Volvo B7L's 66335 MV02VCA & 66345 MV02VCY have left Norwich and moved down to Bristol. 66335 pictured at Caister Road whilst on loan during the summer. 33161 LR02LXW has headed north to Rotherham for refurbishment and repaint into the new Orange line livery. Coach 20514 WV02EUP has finally returned to Ipswich after internal refurbishment at Rotherham. 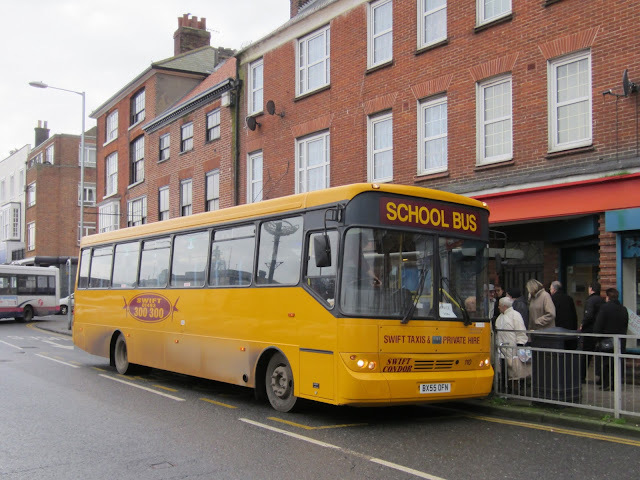 Yarmouth Dart 42920 EU05AUM has returned to service after repairs and repaint at Full Circle, Banham. Lowestoft Gemini 37566 AU58ECE is at Full Circle for repairs along with Enviro 33819 YX63LKJ. 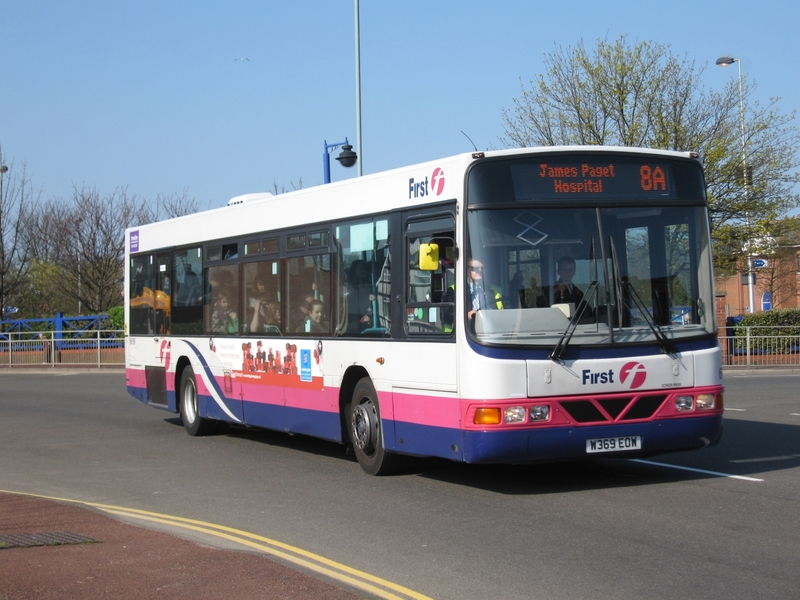 New Streetlite 63320 SK65PXA has arrived at Roundtree Way with 63327 SK65PXH now at Heysham Docks. 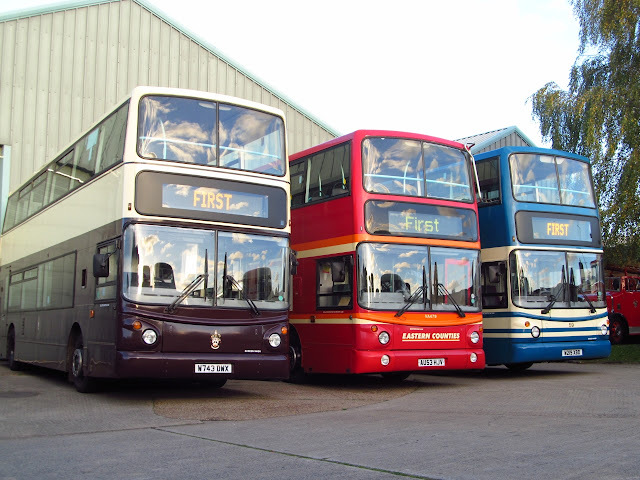 The second of the recent arrivals from First Berkshire has reappeared at Caister Road after repaint, 37274 LK58EDF has been added to the Excel fleet joining other Geminis 37573 & 37578. It is a timely addition as the frequency for the X1 between Yarmouth and Norwich goes to 15 minutes soon as part of a timetable revamp. 37274 at Caister Road this morning ready for its first outing. Apologies for the photo not being my usual standard, it was a tad hurried! 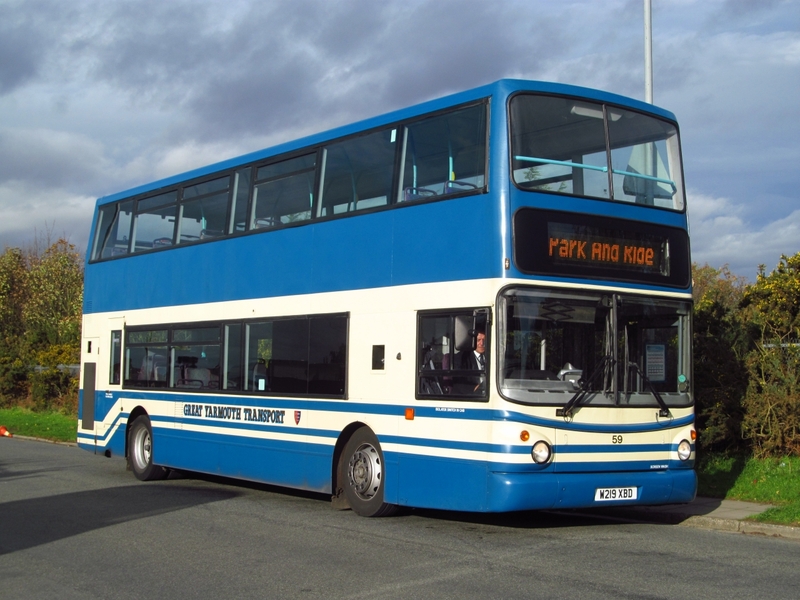 Other bits to report from Caister Road include the imminent return of Dart 42920 EU05AUM from repair and repaint at Full Circle. Newly painted 32112 from Norwich is curently here for MOT. And finally as noted elsewhere 32348 has regained its true identity after appearing incorrectly as 32438 on return from repaint. 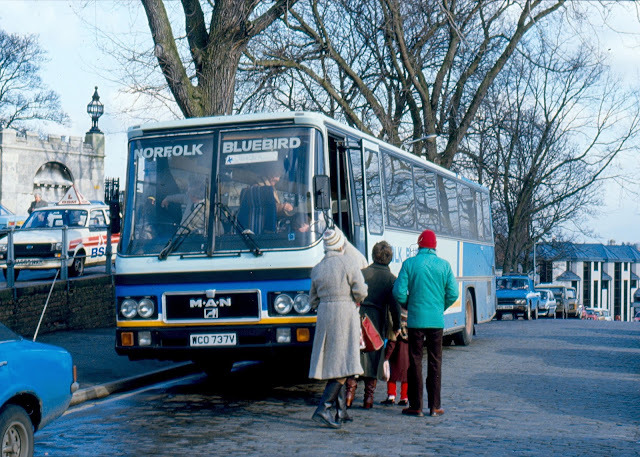 I particularly targeted the new StreetLites as the subjects of some photos, but my first picture is of First Berkshire Plaxton bodied Trident 33153 LR02LXM on loan to Norwich. I was particularly intrigued by the prefix of TN next to fleet number! 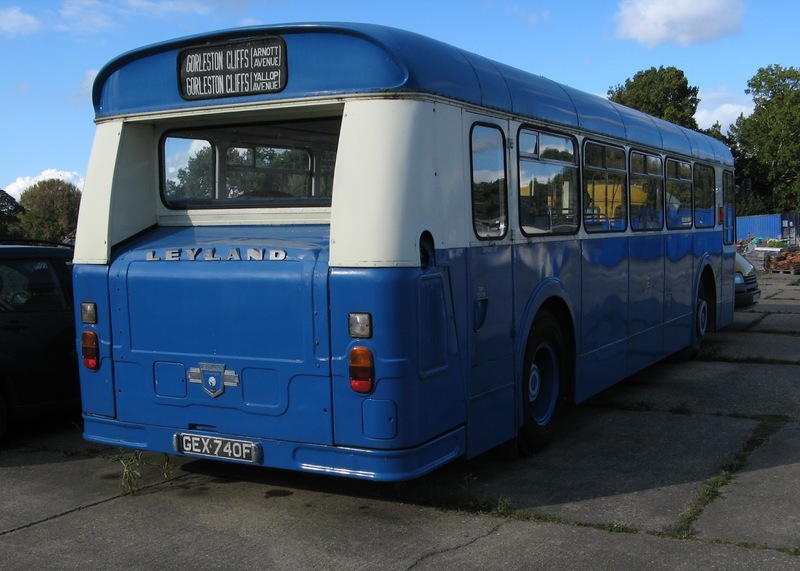 I have subsequently been contacted by owner Colin Thorne who has moved it to the Yeldham Transport Collection in Essex. He has provided some pictures of its arrival there later in the day and, despite hoping to get there before the Olympian did, the recovery vehicle got there first! An unexpected collection of foliage! On its arrival a group of bus engineers gave the vehicle a once over and it looks as though more parts will be needed before it can run again. Colin mentioned the issue of the Yeldham Transport Collection being kicked off their site due to the landlord selling to developers. The Collection has yet to identify any suitable new home and could be told to vacate with just four weeks notice. I quickly dug out the trusty camera and, as the light was a bit low, there was a delayed camera reaction but I did get the above photo. 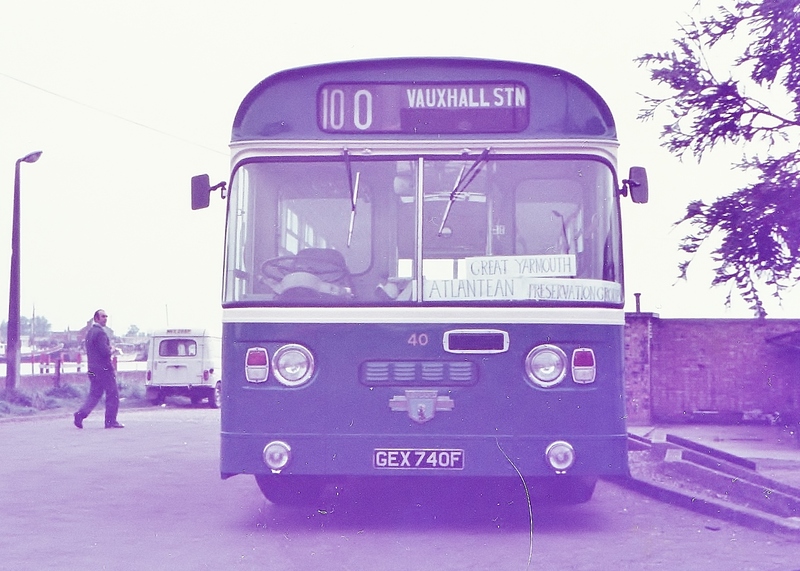 With Routemaster JJD480D in service again it would appear that Caister Road is low on vehicles once more! At the time of the first photo, it was owned by the Great Yarmouth Atlantean Preservation Group. It was subsequently sold and stored in North Yorkshire for a while. Later No.40 spent some time in Hertfordshire prior to it being acquired by a private owner and is now based locally. Earlier this morning saw an exodus of Volvo Olympians from First's Great Yarmouth depot at Caister Road - well three actually! At almost precisely ten o'clock the VG Nash & Son towing truck arrived to take the Olympian to its new home. It wasn't what I expected though and I later found that it was a '1987 American 8x4 tag axle Freightliner recovery vehicle with Zack-lift under reach equipment'! On one side was ex Leicester Gemini 32629 whilst on its left was one of the Wright StreetLites.